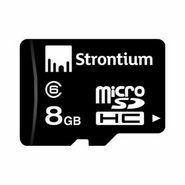 If you need a thunder-speed data transfer, the more you should try out Strontium MicroSD card Class 4 that would show you the real power of speed. With an improvement of transfer speed to 6Mb/s, you will be amazed that the data transfer is complete with a blink of your eyes. It can store higher definition of videos, higher resolution of photos and you dont have to worry about losing your precious data.